How do I log out of PureCloud? To access user settings, click your profile picture in the sidebar. View your profile. To view and customize your profile, click the larger profile picture. For more information, see Profile page. For more information, see Change presence and status. View your organization name Your organization name appears next to the building icon. If you are member of more than one organization, PureCloud also shows the name of the organization you are currently logged into. For more information, see Organization names and log in. The geolocation indicator under your name and title lets others know your current location. If the administrator enabled geolocation for your organization, you can choose to share your current location with others. To enable PureCloud to share your location in the Windows desktop app, click Preferences and then click the General tab. In the Mac desktop app, Apple Location Services manages geolocation. For more information, see Share your current location. In the browser app, the web browser manages your location setting. For more information, see Share your current location. Add a custom message To provide additional information about your presence, status, or location, for example, “Back at noon,” Type a brief message next to the quote icon. For more information, see Change presence and status. Select your phone. To make and receive calls or to select a different phone, select a phone. Type the phone name in the Search field next to and select it from the suggestion menu. 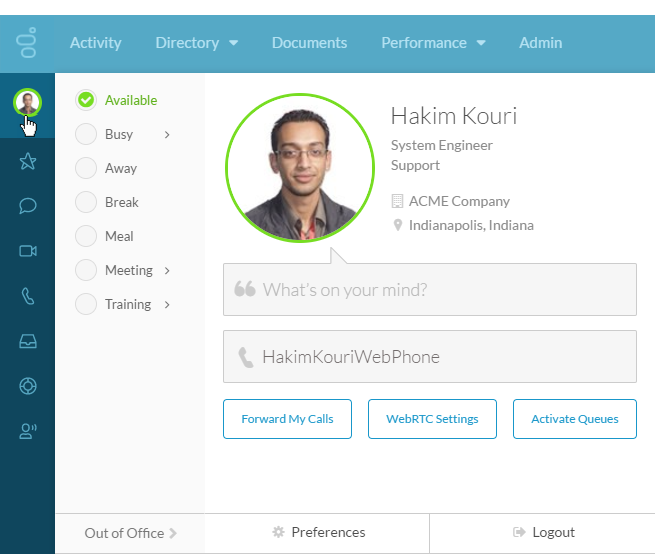 For more information, see Select a phone and Select the PureCloud WebRTC phone as your phone. Forward your calls. To enable call forwarding and to configure a forwarding number, click Forward My Calls. For more information, see Forward incoming calls. Select your PureCloud WebRTC phone settings To select your microphone and speaker if you selected a PureCloud WebRTC phone, select WebRTC Settings. For more information, see Select the PureCloud WebRTC phone. Choose queues to work (Agents) To access the Active and Available Queues lists and to specify queues, click Activate Queues. This setting applies to agents. For more information, see Choose queues to work. Set Out of Office status To provide a start date and time for periods you are away, click Out of Office. Optionally, include the end date and time. For more information, see Change presence and status. Access your preferences To customize your preferences for sound, notifications, chat, password, voicemail PIN, and language options, click Preferences. Some preferences are specific to the app you are using (browser, Windows desktop, or Mac desktop). For more information, see Change browser app settings, Change Windows desktop app settings, and Change Mac desktop app settings. Log out To log out of PureCloud, click Logout. For more information, see Log out.